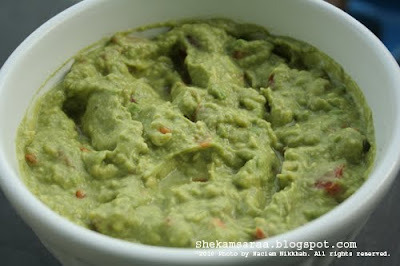 This is probably not an authentic recipe for guacamole, but it definitely is easy and tasty. In a medium bowl, add the avocadoes and the juice of 2 limes and mash the avocadoes with the back of a fork until smooth. Add the chopped tomatoes, minced garlic, salt and pepper, chopped cilantro leaves and chopped red onion (if using). Mix until well combined. Served with tortilla chips. آواکادو را توی یک کاسه بریزید و آب لیمو را گرفته به آنها اضافه کنید. با یک چنگال آواکادو را له کنید. گوجه فرنگی، سیر، نمک و فلفل را اضافه کنید و مخلوط کنید. گواکمولی را با چیپس سرو کنید.